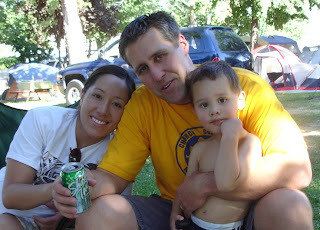 Aunt Michelle, Uncle Jake, and Cousin Matani have been in town visiting from Tucson, Arizona this week. They are the only "Hinckley's" that live outside of Utah so it's always a treat when they visit. They are expecting a son next month. Bryson was happy that Jake was able to make it back from an EFY in Virginia to spend time with him at Cherry Hill today. 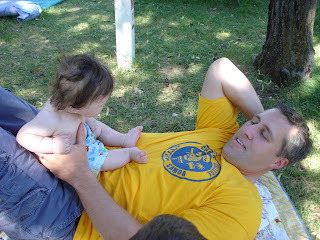 Jake is a seminary teacher but during the summer, travels around as an EFY speaker. 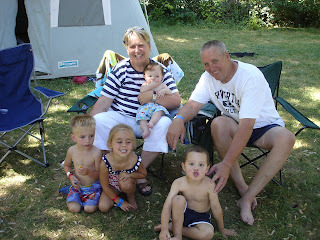 Granny Goose and Grandpa Hink (my parents) with their four grandchildren at our campsite after a very hot, but fun day at the waterpark.